THE SERVICE .45 automatic pistol is an extremely accurate gun, but for good shooting to be had with this or any other pistol the user must have a certain degree of training with his weapon and proficiency in its use. To expect a man to do good pistol shooting without practice is nearly as absurd as to expect him to swim without ever having been in the water or to play a good game of golf without having had a golf club in his hand. Now there are good and bad ways of teaching anything, and the bad way to teach pistol shooting is to place a highpower loaded gun in the novice's hand and a target in front of him and let him go ahead as though he were entirely familiar with what he is doing. This is such a bad way to teach pistol shooting that the chances are that instead of making a man into a good pistol shot it will lay the foundations for making him a thoroughly bad one. In the first place, the pupil will lack co-ordination between hand, wrist, and eye. The gun will feel clumsy and awkward in his hand. The sights will be difficult to align. He will jerk the trigger instead of pulling it smoothly. If in this stage of his training he attempts to do actual shooting, he will have such difficulty in hitting the target at all that his confidence may be forever destroyed. Obviously the first thing to do is to let him practice aiming and snapping with an unloaded gun until the necessary muscular and nervous co-ordination is obtained. Even when this stage is reached, it is a mistake to let him use high-power cartridges for his first actual shooting, for he has not yet had any experience with the noise and recoil of the large calibers. Thus his anticipation of the explosion and disturbance which he knows will come when the trigger is pulled will cause a nervous strain which is very likely to result in flinching. And the habit of flinching, when once acquired, is very hard to get rid of, especially as the kick of the pistol will mask the flinch to such an extent that the user will be unconscious of it. Experience has shown that the way to overcome these difficulties and lay a solid foundation for good pistol marksmanship is to progress from "dry shooting" or snapping practice with the empty gun, to actual target practice with .22 caliber cartridges. The .22's make relatively little noise or disturbance, hence all nervousness on that account is removed; yet they are so superbly accurate that the scores made on the target will give a perfect record of the proficiency of the shooter. Another advantage of the .22 long rifle as a practice cartridge is the fact that it costs just one-seventh the price of the .45; in other words, for the same expenditure of funds the shooter can indulge in seven times as much practice as he could if he were using the larger caliber. Moreover, owing to its comparatively low power, practice can be carried on in many places where shooting with a .45 would be impossible. How the .45 is changed to .22 caliber: The Service Model Ace parts, upper left, are substituted for the .45-caliber parts, upper right. Parts shown in lower half of picture are common to both calibers. For the reasons just mentioned it will be seen that the .22 as a practice cartridge is ideal, not only for the beginner, but also for the accomplished pistol shot who wants to keep his hand in by shooting from time to time. From the viewpoint of the owner of a .45 automatic, it will be seen that what is wanted is a .22 caliber automatic pistol that will duplicate the size, shape, balance, feel, and action of the regular .45 automatic; or even better, since the gun is readily taken apart without tools, a .22 magazine, barrel, and slide which can be used interchangeably with the regular parts to allow the gun to be converted from .45 to .22 and back again. These facts have long been recognized by the makers of the .45 automatic, but such formidable engineering difficulties lay in the way that it is only recently that the problem has been solved by the use of the "Floating Chamber", an amazingly effective invention which is so simple that it is surprising that it was not thought of before. It is interesting to note that this new idea did not originate in the highly trained technical organization of some big arms company, but instead was the work of a young man working entirely on his own in an auto repair shop in a small country town. The inventor, Mr. David M. Williams, of Godwin, North Carolina, thought out the idea for himself, and then proceeded to make up and try out a high power rifle, a .22 caliber rifle, and a .45 caliber pistol converted to .22 caliber, each using the floating chamber principle. He did the work himself, using for material what scrap automobile parts he could find around the shop that seemed to him to have the required strength. Most of his parts were made from old Ford rear axles. When his models were completed, it was to this writer that Mr. Williams brought them for his first demonstration, with the idea that the Government might be interested in having him make up a military rifle on this principle. It required only a very brief examination of his guns and a few minutes talk with the designer to show that he had a tremendous lot of gun knowledge, and that everything he had done had been reasoned out most carefully, by the aid of good hard common sense, and that in addition he was a born mechanical genius. Like that outstanding figure of the gun world, the late Mr. John Browning, Mr. Williams is a "natural". And like Mr. Browning, he is quiet and unassuming, and is a man of few and simple words, who does his own thinking. The models Mr. Williams brought in looked so good and shot so well that he was given a contract to convert a .30 caliber Browning Machine Gun so that it would shoot .22 caliber cartridges automatically from a belt. The Army had long wanted such a gun for training purposes, but most experts were of the opinion that such a gun could not be produced. Mr. Williams accomplished the job in just six weeks, and his .22 caliber Browning Machine Gun is now standard in the Army for short range or indoor training. His .22 conversion of the .45 also looked good, but as it was based on the existing .45 automatic made by Colt's, he was advised to take his invention to them, and was given a letter of introduction to the president of the company. The result was that he made an agreement with Colt's for them to use the Williams Floating Chamber, making a new .22 caliber automatic pistol. Diagram showing action of floating chamber in Colt Service Model Ace. Barrel is pinned to receiver by slide stop, and cannot move. Upon firing, pressure of gas on front end of movable chamber drives same to rear until lug on bottom strikes corresponding lug on barrel, and stops the motion. 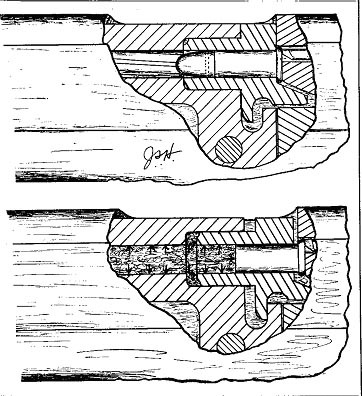 As floating chamber rests against breech block, which is part of slide, this motion is transmitted to slide, which is thus thrown to rear against action of recoil spring, at same time cocking hammer and compressing mainspring. Before describing this device and the new Colt "Service Model Ace" .22 which it made possible, let us say just a few words to avoid any possible confusion between the new Service Model Ace and the regular Colt Ace .22 Automatic which has been on the market for several years. In designing the regular Ace, the makers were constantly faced by the fact that the .22 long rifle cartridge lacks sufficient power to drive a heavy slide back against its recoil spring, at the same time cocking the hammer against its mainspring. Add to the basic fact that the cartridge lacks recoil power to operate a heavy automatic the further fact that there are over 50 various makes, kinds and types of .22 long rifle cartridge, and that the public will expect the gun to handle any one of them equally well, and you can see what a problem was involved. 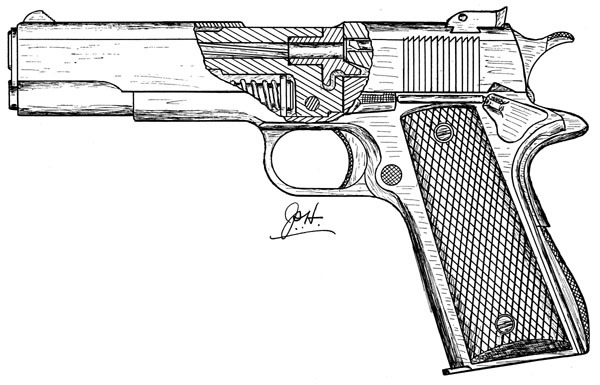 IMAGE - Action of the floating chamber in the Colt Service Model Ace Upper.• Position of parts at instant of firing. Floating chamber, with cartridge, is held forward by slide, under pressure of recoil spring. Barrel is held fast to receiver, and cannot move. 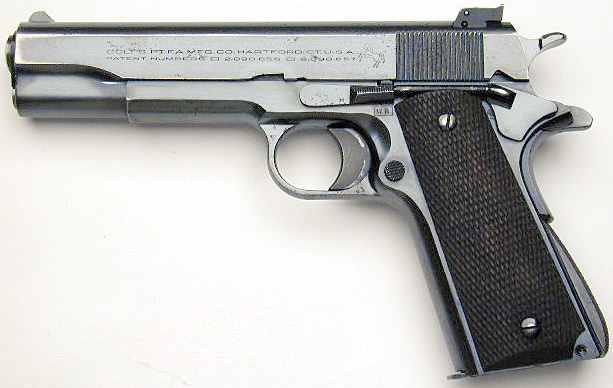 In order to insure that the Ace would always give automatic functioning, it was necessary to lighten the slide, the recoil spring, and the mainspring as much as possible, as well as to change several other parts so that they were different from those in the .45. For this reason it was not possible to furnish the Ace slide, barrel, and magazine to be fitted onto the frame of the .45. The pistol had to be fitted and sold as a unit. Because the slide and the springs are made as light as possible, the recoil is very light and the slide makes little disturbance in going shut, so that the regular Colt Ace is a very pleasant gun to shoot. However, for some purposes, a rather sharp recoil and a consequent disturbance of aim are desirable. A .22 Automatic that gives a good strong kick will more closely simulate the action of the .45 and will consequently give better rapid fire practice for the man who is preparing for service pistol matches. That is exactly what the new Colt Service Model Ace gives. The "floating chamber" practically quadruples the recoil power of the .22 long rifle cartridge, and the result is a recoil that strongly reminds the user of the .45, though in fact it is considerably less. And this increased recoil means that the gun has ample power to enable it to work under almost any conditions. This extra power makes it unnecessary to reduce the weight of the slide or the strength of the recoil spring or the mainspring. Thus it is now possible to furnish only the .22 caliber magazine, slide, and barrel with ejector, which will fit onto any Colt .45 receiver in place of the regular parts. The accompanying sectional sketch shows what the Floating Chamber is and how it works. Instead of having the cartridge chamber integral with the barrel, it is in a separate cylindrical piece which fits into a corresponding recess in the barrel and is free to move back a short distance independently of the barrel. When the ordinary.22 Automatic is fired, the force which drives the breech block backward against its spring, and thus opens the gun, is the pressure of the powder gas on the inside of the cartridge head. As mentioned above, this force is insufficient to operate the heavy slide against the hammer and mainspring of the Service .45. In the Service Model Ace, this pressure acts on the inside of the cartridge head as described, but this is only a relatively small part of the power that is applied, for the powder gas also gets into the space between the barrel and the front end of the movable chamber, and acting on its comparatively large front surface, drives the entire movable chamber, cartridge and all, to the rear against the slide. The force thus exerted is roughly four times that available through the cartridge head alone. Thus the .22 caliber cartridge has its recoil power multiplied sufficiently to operate a heavy slide against a stiff spring, and at the same time to give the entire gun a kick that gives the illusion that a large caliber automatic is being used. The amount of power used, and the strength of the resultant kick can be made almost anything desired by changing the outside diameter of the floating chamber and the distance through which it is allowed to move backward. It gives sufficient reserve power to insure certainty of functioning, even with old or inferior ammunition. The reserve power available makes it possible to supply .22 caliber parts which will fit on the regular .45 caliber receiver and can be depended on to work even when old guns are used which are of war-time manufacture or otherwise not up to standard. This idea of making a gun barrel in two pieces, one of which slides within the other and-with a gap for the bullet to jump, may at first thought seem somewhat radical, and no doubt this is the reason that such a gun was not put on the market long before. But a little reflection will show that essentially the same thing has been used for years in revolvers, where the cartridge chambers are contained in a cylinder which is not a part of the barrel at all, and is actually separated from it by quite a gap across which the bullet must jump. If we should describe these two systems to a man who was totally unacquainted with firearms, and ask him which was the better system, he would no doubt say that from an engineering viewpoint the Service Model Ace is better, because the chamber is held in positive alignment with the barrel at all times, and there is no open passage for the escape of powder gas between the barrel and the chamber, as there is in the revolver. The question has been asked as to whether or not there is any chance of trouble from corrosion between the barrel and the floating chamber. There is no reason to expect trouble from this cause, for the floating chamber is readily removable with the fingers alone, and is easy to clean if cleaning ever becomes desirable. But with modern noncorrosive ammunition the old practice of cleaning the gun each time it is fired is entirely unnecessary, though of course a gun like any other metal object should be oiled before being put away for long periods. As a practical test of the possibilities of trouble from this cause, all cleaning of either the barrels or the movable chambers has been omitted during several weeks of almost daily firing of a complete Service Model Ace and of a set of .22 parts on an old .45 receiver. Not the slightest trouble has been encountered and the parts look just as they did when they were received. As a check on the amount of reserve power made available by the floating chamber, old and deteriorated ammunition was purposely used in a large percentage of this shooting, and whenever the cartridges would go off at all, the slide would open all the way and the gun would function, showing that there is plenty of power and some to spare for even the weakest .22 long rifle cartridge. By loading them one at a time (because they would not fit in the magazine), .22 shorts were also tried. While they made excellent groups, they did not fully open the slide, as the end of the floating chamber does not come at the right place in relation to the peak of the pressure curve. The gun could, however, easily be made to operate with shorts by giving suitable dimensions to the floating chamber. 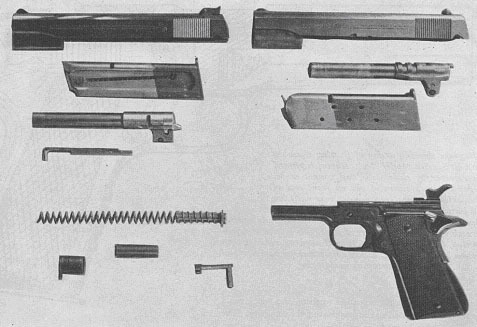 As may be inferred from what has already been said, the Colt Service Model Ace .22 can be had either as a complete gun, or as .22 parts only, for use on the receiver of a .45 automatic already on hand. The Service Model Ace offers a most effective method of training for proficiency with the Service pistol, and such an economical one that the amount saved on ammunition in just a few days' practice will pay for the gun. Because of those very features which make it an excellent training arm -- recoil, service trigger pull, etc. -- the Service Model Ace will probably not appeal to the man who is interested solely in a target pistol for competition in .22 events. Here the Woodsman and Hi-Standard with their light recoil, lighter trigger pull and less "sensitive" grips remain better.